Using the beautiful and complex landscapes around the Sitka Center, students will learn the benefits of engaging in contemporary drawing methodologies, from extended blind contour line drawing to over drawing, collage, recombining, extreme abstraction and use of nonrepresentational color and line work. 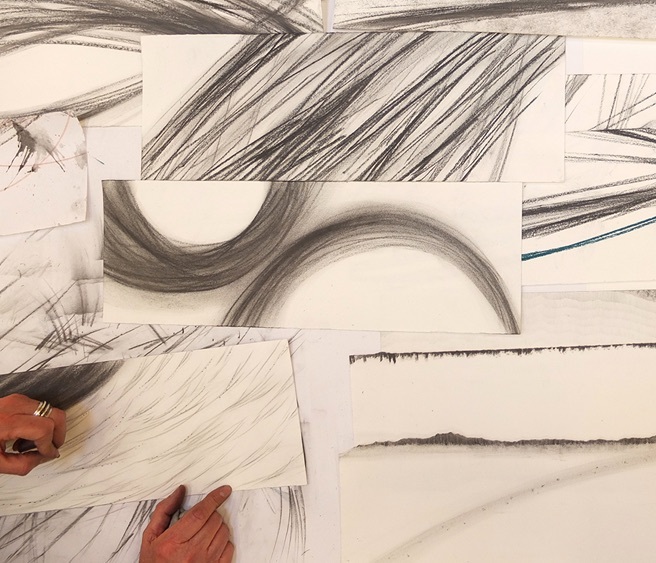 The goal of the workshop is two fold: to give students the freedom and confidence to express their own hand and to expose students to contemporary drawing techniques that are the center of significant art movements of the late 20th and early 21st century. This course adds another layer of understanding in that our subject is complex ecological systems. Students will create a series of drawings in sketchbooks as well as larger format drawings. contour line and using multiple media. Anne Godfrey teaches drawing and photography practices in pursuit of engaging the landscape. Godfrey has taught thousands of students in contemporary drawing and photography since 2005 at UO, SUNY-ESF, Lane Community College and UNM. In 2014 she was named one of the 30 Most Admired Educators by Design Intelligence. Her book PhotoScape (Routledge Press) comes out in 2020. Formerly a member of the University of Oregon Landscape Architecture faculty, she now teaches at SUNY College of Environmental Science and Forestry, where her work hybridizes art practices with environmental design. • One large dry media tool such as charcoal/ graphite stick, etc. • A couple of drawing media that are water soluble or \"release\" when water is applied. • Your small kit of essential drawing tools needs to be carried into the field easily.